Catboy, Owlette and Gekko are back to save the day. Disney Junior’s CGI animated PJ Masks TV show has been renewed for a second. Animal amulets activated. The PJ Masks TV series voice cast includes Jacob Ewaniuk, Kyle Harrison Breitkopf, Addison Holley, Alex Thorne, Grey Griffin, Trek Buccino, Brianna Daguanno, Julie Lemieux, Ron Pardo, Tristan Samuel, and Rob Tinkler. PJ Masks is produced by eOne and Frog Box, in collaboration with French animation studio TeamTO, and with Disney Junior and France 5. A pre-school super-hero show, the series is based on French author Romuald Racioppo’s picture book series Les Pyjamasques. 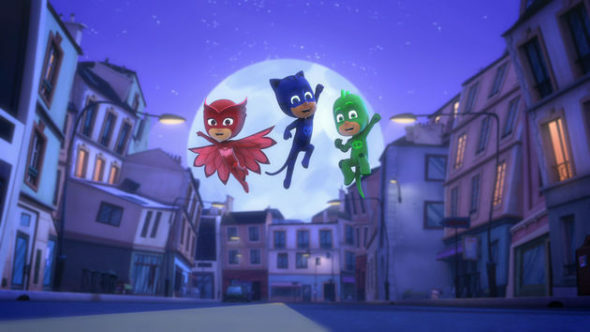 PJ Masks follows the thrilling night time adventures of three young friends who transform into their dynamic super hero alter egos, Catboy, Owlette and Gekko, when they put their pyjamas on at night and activate their animal amulets. Together they embark on action packed capers, solving mysteries and learning valuable lessons along the way. Entertainment One on Wednesday said that a second season of its preschool animated superhero TV show PJ Masks, which airs on Disney Junior and France 5, has been greenlit for production and is set for delivery from fall 2018. The new 52 episodes of 11 minutes will be produced by eOne and Frog Box, in collaboration with Disney Junior and France 5. They will bring fresh adventures for CGI-animated characters Catboy, Owlette and Gekko as they save the day from the show’s nighttime villains Luna Girl, Romeo and Night Ninja. In the U.S., the show airs daily on Disney Junior. In the first quarter, the show reached 8 million kids aged 2-5. PJ Masks has also launched on-air in a number of international territories this year, including the U.K., France, Italy, Spain and Australia. The first season will continue to roll out on Disney Junior channels around the world throughout 2016 and 2017. What do you think? Is there a PJ Masks TV series fan in your house? Do you plan to watch the second season? Tell us. More about: Disney Junior TV shows: canceled or renewed?, PJ Masks, PJ Masks: canceled or renewed? My daughter loves this show, and oddly enough she loves Gekko. Thanks to her Now the show is known to other children who hang around her. I’ve been trying to find PJ Masks stuff for her. She only has their chair. I hope they start making Gekko light green girl bed sheets with hearts or something. No. We don’t care for the show.